Suppose White invades in answer to . This occurred in a game Yi Sang-hun-Kim Mansu (B) 1995-05-01. It also was seen in the recent game O Rissei-Alexandre Dinerchtein (B). 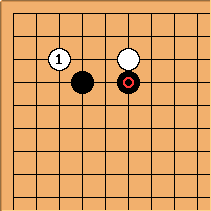 It is expected that Black will play , as in that game, for the sake of good shape. Now the game from 1995 had White next at a. What was played by Dinerstein was the move at b (which he said in his commentary had been played by Yi Ch'ang-ho against Hane Naoki). Clearly what happens next depends very much on the adjacent side positions. Andy Pierce: I recently got a good result playing this as white in a handicap game. 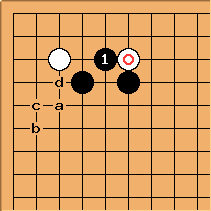 By attaching, black wanted to settle the position early and put a good chunk of territory in the bank. I invaded at 3-3 primarily to deny black his intent and give him something unexpected to think about. I also found the residual aji of to be useful, although I never actually tried to move this stone.